I have often wondered where my interest and fascination with cities came from. I remember that I liked playing touch football in the street, But other kids, like little Alberto Gonzales, spent their time torturing cats and insects, that Ratzinger kid was always praying and humming the Horst Wessel song, and then there was Hughie Hefner. I used to joke to my grad students when they asked me about my interest in urban planning that I was born in the back of a taxi because of traffic congestion. The nearest I can trace my urban interest is some of the movies I used to watch when I was a kid. Other kids liked westerns and Disney films. I liked The Bowery Boys. 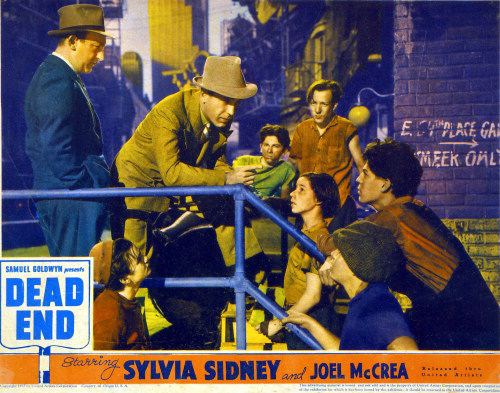 The Bowery Boys * started out as the “Dead End Kids” in one of my favorite movies, Dead End(1937), a film strongly influenced by the prevailing social thought of the American 1930s and 1940s that stressed the influence, mostly negative, of the urban environment upon the shaping of values in children. The title not only refers to a street that terminates at the East River (a convenience that suited well that fact that the film followed a stage play and was itself filmed on a soundstage), but also unambiguously indicated what social outcome could be expected from the dense, dirty, blighted, tenement environment of the alley-like streets behind luxury high-rises of the rich. Dead End takes the nurture side of the “nature versus nurture” argument over human behavior: slums were seen as places that breed crime, which was a sociological as well as popular theme in those days. The story centers mostly on the antics of a group of young boys whose playground is the narrow street behind high-rise apartment of the rich. They beat up and rob a rich kid who lives in the high rise, much to the amusement of “Baby Face” Martin (Humphrey Bogart), who used to live in the street and who has grown up to become a notorious public enemy for his crimes. Martin is the quintessential bad example for kids, he has money, expensive clothes, and people are afraid of him. All except his mother, who still lives in the tenement and who greets his return with a smack in the face Martin has had surgically-altered to disguise him from the police. Little doubt is left that Martin’s criminality is a result of his upbringing in the streets of the slum. So also is the sorry state of the girlfriend of his youth, Francie (Claire Trevor), whom he learns to his disgust has become a prostitute and now has a venereal disease. Poverty, a certain contributing variable, also plays a role. Food is stolen from babies, roaches infest the tenements, kids fight over pennies and encourage one another to steal from their parents. But there’s also a strong theme related to hardened class divisions that are difficult to breach. Drina (Sylvia Sidney), the sister and sole “parent” of one of Tommy (Billy Halop), joins a picket line striking against the low wages in her place of work and is beaten by the police for her efforts. Dave (Joel McCrea), her love interest, is an architect with ambitions to renew the area of the slums. But all he can manage by way of work is some sign painting for a local restaurant. With his noble ambitions, and his humanity, Dave is an example that the poor might rise to higher station, but also demonstrates that there are no guarantees that getting an education conveys an exit visa from the ghetto. Meanwhile Dina dreams of escape to an idyllic countryside, a more popular fantasy in the late 1930’s than today. Drina and Dave are also products of the mean streets of the slum, but are proof that anti-social lives in them are not an inevitability. Dave even has a brief, but doomed, dalliance with a bored and self-indulgent, rich girl, Kay (Wendy Barrie); films of the time still recognized the social class barriers of the big City. Much of the plot of Dead End is driven by class differences. At the other end of the social scale are those in the high rises that overlook the cramped alleys as well as the East River. In the screenplay the rich come in for their fair share of facile sociology as well. Essentially arrogant, absorbed with their idle pursuits, they are insensitive to the travails of the lower classes with whom they live—spatially at least—side by side. Judge Griswald’s brother with his superior attitudes and notions and of what is appropriate to protect the privileges of his class, is particularly galling. The socially parasitic Kay is only pathetic. Although there is spatial proximity there is no social proximity among the denizens of Dead End . The rich live above, the poor below, the rich send their children to tutors and private schools, the poor learn in the streets and reform schools, the rich are insulated in their private cars, the poor get around as they can. Most of the action of Dead End takes place in the street at the end of the river. Here the young boys convene their indolent lives each day, squabble, plot fights with other gangs, initiate newcomers, and generally comport themselves like they are destined for reform school or worse. Their heroes are not Dave, whom the respect, but figure he’s going nowhere, but characters like “Baby Face Martin,” or tough guys from reform school. They taunt the local beat cop and the other “uniform,” the doorman for the rich apartment building. The impression is that these are kids who are one misbehavior away from reform school, which is more likely to teach them more sophisticated criminal behaviors, and the then on to prison. The sociology of the time was that it was the streets, tenements, and lack of parental guidance that made these kids this way. “He’s not a bad kid,” it is said of Tommy (Billy Hallop), who his sister is trying to keep out of trouble. A year Dead End came out the film Boystown was released. The community for orphans and runaway boys was founded by Father Flanagan in countryside in the Midwest, the idea being that a little fresh air, distance from bad influences, and “tough love” were what was needed to put the lives of young boys on a straight path. The notion that abuse breeds abuse, another common present day theme, is also present in Dead End : Angel’s father is a drunk and beats him and his mother. The pathologies of slum life almost become a badge of distinction “TB, I got TB,” one of the boys intones almost with pride. These were common themes of the time the film was made in the Depression, and remain somewhat popular, if leavened by subsequent analysis. Many urbanists regarded slums as breeding places of both social dysfunction and seditious politics. The labor movement was very active and even some Hollywood actors and writers, as the congressional HUAC hearings brought out, had at least an intellectual interest in the prospects of communism. But crime trumped all other cinematic themes for films about and set in the City. So, you’re wondering, with such role models, how did the writer of this piece grow up to be such a nice guy?